Description: This is New Belgium’s 2015 vintage of their La Folie series of sours. Much like last year’s, this beer is brewed in venerated Oud Bruine style of Belgian sours, combining Pale, Munich Carpils, C-80, Chocolate malts are combined with Nugget hops. It is then fermented using wild brettanomyces strains and then barrel aged in oak barrels for up to 3 years. Tasting Notes: This year’s offering was much as I remember, tart and sour as all get-out! And much like a good sour brown, it possessed all the usual oaky, fruity, and yeast notes, bringing to mind flavors of sour cherry, plum skin, and red wine tannins. Description: Fresh from Portland Maine comes this White IPA, part of Peak Organic’s regular lineup. It is brewed using local wheat and Belgian yeast, and then bittered using a combination of West Coast Centennial, Simcoe and Citra hops. Tasting Notes: Yet another sampling from the Advent Beer Calendar, this White IPA was a fitting example of this resurgent style of beer. Wheat malt and Belgian yeast provide a smooth, refreshing base, with is then accompanied by notes of citrus and tropical fruit that pair nicely with the yeast’s spicy finish. 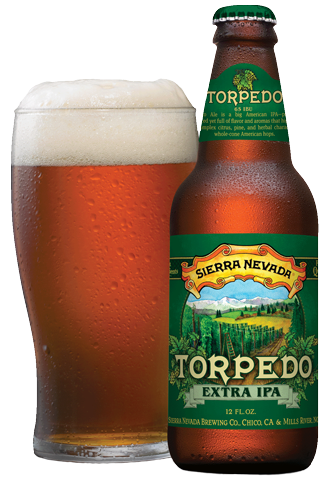 Description: This classic American-style IPA is part of the brewery’s year-round lineup, and was the first of their beers to feature the “Hop Torpedo” – a special dry-hopping device that controls how the level of hops infused into the brew. It is fashioned using Two-row Pale and Caramel malts, bittered with Magnum, Crystal and Citra hops. Tasting Notes: Oftentimes, I get comments about my Best Of lists, usually by someone who is surprised their favorite beer didn’t make the cut. Alas, one commenter did make me realize that this is one beer that, though I have tried, I have never reviewed. And while it won’t be making my Best Of list just yet, it is certainly a good and faithful example of a solid IPA. Rich and slightly sweet malts compliment a hop profile that is powerful and varied, combining both dry-hops and finishing hops to give it a grassy, citrusy, and mildly tropical flavors – in short, all that North American hops are known for. A noble creation and one that makes me want to explore Sierra Nevada’s wares again. Thanks for the recommendation Brandon Kump!